Last night, when I got my FreeBSD & ZFS based Time Capsule running, I had to connect my laptop to the same network as the server in question. This is not ideal. My usual work flow: connect to the WIFI, then connect to the VPN, then I get access to those services. These are different subnets, so the Netatalk broadcast does not traverse the switch. It stays inside so my laptop does not see the server. You connect via Finder, and attach the server manually. Then you connect via Time Machine. Here’s what I did. Go to Finder, press Command-K which pops up the Connect to Server window. afp:// is the protocol. 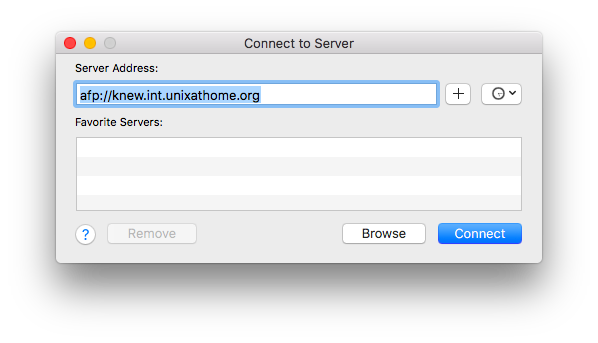 knew.int.unixathome.org is the name of the server providing the Time Capsule service. Click on Connect, and you should see the next window. This window is asking for the credentials to connect. 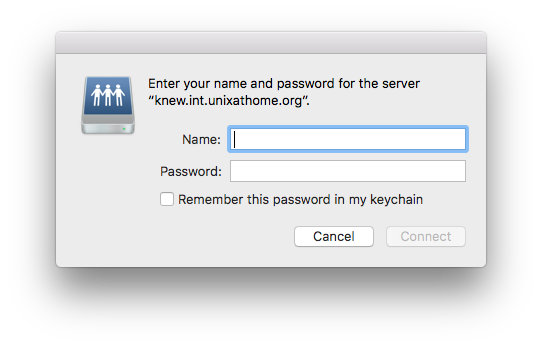 This can be any unix user, but it also matches the user name specified in the valid-users section of the /usr/local/etc/afp.conf configuration file. After the afp connection is established, you enter your credentials.